The technology, which was demonstrated at CeBIT in Hannover in March, provides an innovative way of controlling the interconnected electronic devices that will populate the smart homes of the future, granting increased autonomy to people with physical disabilities as well as pleasing TV channel-surfing couch potatoes. “The BCI lets people turn on lights, change channels on the TV or open doors just by thinking about it,” explains Christoph Guger, the CEO of Austrian medical engineering company g.tec that developed the application. g.tec teamed up with a group of international universities and research institutes as part of the EU-funded Presenccia project to incorporate its BCI technology into virtual environments. As part of the project a fully functioning smart home was created in virtual reality (VR). “It has a kitchen, bathroom, living room… everything a normal home would have. People are able to move through it just by thinking about where they wanted to go,” Guger says. Electroencephalogram (EEG) equipment is used to monitor electrical activity in a user’s brain via electrodes attached to their scalp. After a period of training, the system learns to identify the distinctive patterns of neuronal activity produced when they imagine walking forwards, flicking on a light switch or turning up the radio. Being able to move and control objects in virtual reality solely by the power of thought could offer new and liberating possibilities for people with physical disabilities. It could help amputees learn how to use a prosthetic limb, for example, or allow people confined to a wheelchair to experience walking in virtual reality, as one experiment conducted by the Presenccia researchers showed. One application developed by g.tec lets people control a small robot with their thoughts, though the same system could easily be adapted to control a wheelchair instead. Four lights on a small box set to flicker at different frequencies provided the control mechanism using a method known as Steady State Visual Evoked Potentials (SSVEP). “The top light, for example, was set to flicker at 10 hertz so, when the user stared at it, the EEG equipment registered that particular frequency in the user’s brain and instructed the robot to move forward. Looking at another light flickering at a different frequency would tell the robot to go left and so on,” Guger explains. g.tec has adopted a different approach to allow people to type with their thoughts. Users sit in front of a grid of letters and numbers on a computer screen which flash in sequence and are told to stare at the character they want to type. The system registers their brain activity when the letter they are looking at is illuminated. “With experience people can learn to type quite fast. I can average about one letter every eight-tenths of a second, a rate similar to typing with one finger,” Guger says. 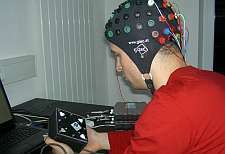 Better hardware, software and a deeper understanding of EEG data has now made typing by thought power a practical application, particularly for paralysed people suffering from so-called locked-in syndrome who have few means of communication. “Just two years ago, it took up to a minute to type a single letter and a whole day to train someone to do it. Now most people can learn to use the system in five minutes,” Guger says. The accuracy of BCI technology has also greatly improved: g.tec was involved in a study that showed 82 percent of people could achieve 100 percent accuracy. “Five years ago there was only one person in the world known to be able to do that,” Guger notes. Where will such rapid progress lead? The g.tec CEO initially expects BCI technology to continue to gain ground in medical applications for the disabled and for rehabilitation, helping people who have suffered a stroke, for example, to regain use of their limbs. However, he believes it could become common in everyday environments. Having been tested in virtual reality, g.tec’s smart home application will soon be deployed in a real smart home being built as part of the SM4all project, which has received funding under the EU’s Seventh Framework Programme. g.tec, which was founded by Christoph Guger and Günter Edlinger in 1999 as a spin-off from the Graz University of Technology, sells its award-winning technology to companies, universities and research institutes in 55 countries. At the moment, it is limited to quadriplegics, and the companies working on it, are in general loathe to talk about non-disabled, for marketing and financing reasons. A few others are developing the interfaces for general use. Emotiv System's EPOC springs to mind. Imagine your motor cortex fully activated while you have full muscle tone but both what your cortex says you are experiencing and what you are actually experiencing are not what you body is actually doing. You were trained to do this on a brain computer interface. Highly Skilled lucid dreamers in intense sessions and brain tomography on the level of seismic tomography make this all possible. Accessing the brain thru non-invasive means is vital in Berlin where Brain Computer Interfacers and the Locked-in are moving things with only their minds; however, one might say that all this research is treading water awaiting advances in Neuro-surgery. I%u2019m pitching the thoroughly developed non-invasive technique as a necessary prelude to the invasive interface. I%u2019m just looking for sympathetic places to post the story I%u2019m telling in the form of a fictitious photo journal.